I wish I could say that I loved The Sky is Everywhere. However, it's the kind of book that all too well reminds me of how fragile life. Yes, “What kind of world is this? And what do you do about it? What do you do when the worst thing that can happen actually happens?” In a nutshell, these few words are the entire premise of this YA novel. The grief overwhelms the book like humidity in the French Quarter and maybe that's the point. I don't have to like it though. Maybe it's because I'm fully realizing my own mortality that this book just doesn't settle well with me. Frankly, I don't want reminders of my imminent demise. Be that as it may, I can see how this novel might appeal to a young adult. There must be something about junior year in high school that the entire world seems to collapse. This books is so full of melodrama that even as an adult I'm overwhelmed not only by Lennie's runaway mother, her grief of her dead sister Bailey, her "Mean Girl" rival with Rachel, her horribly dysfunctional relationship with Toby, and her first puppy love romance with Joe. Joy is all too brief and it's a little hoaky that Joe has become the collector of Lennie's poems. According to Lennie, “My sister will die over and over again for the rest of my life. Grief is forever. It doesn't go away; it becomes a part of you, step for step, breath for breath. I will never stop grieving Bailey because I will never stop loving her. That's just how it is. Grief and love are conjoined, you don't get one without the other. All I can do is love her, and love the world, emulate her by living with daring and spirit and joy.” Pretty eloquent for teenager right? Yet, this eloquence seems well beyond her years. I guess that was the most difficult aspect about reading The Sky is Everywhere because in some ways it was tough to remember that Lennie was still in high school. It was confounding that she was virtually unaware of her sexuality and then for it to emerge after the sudden death of her sister. I was especially disturbed when I realized that not only were Toby and Bailey engaged to be married, but she was also carrying his baby at the time of her death. Given that, even though Lennie and Toby are both ensconced in grief, I was angry that they both turned to each other sexually. The abrupt resolution of this dysfuctional liason was even more confusing. The poetry is my favorite part of the novel. 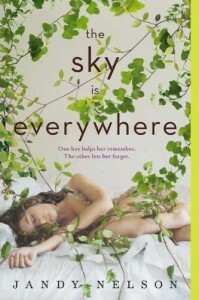 Stuck in "The Sky is Everywhere"
I started reading this book because of a student recommendation. Although I have not read much of The Sky is Everywhere, something about it makes me hesitate delving further into it. The entire premise of it is so inherently sad. I cannot imagine a world where my sisters do not exist and for a mere teenage to experience something so life altering as the death of a sister is not my version of leisurely reading. I will push through reading the novel because I need to return it to my student. However, I am a little disturbed that Lennie's grief pushes her into the arms of her dead sister's boyfriend, Toby. Nevertheless, I'll keep reading because, if nothing else, I need to know how Lennie is going to sort this twisted relationship out.